If you’re like me, your ever-expanding tool chest is overflowing with implements and forgotten accessories we might use a few times a year, plus the many once-believed worthwhile oddities (FYI, the Manitou M-Prep grease gun is kept in the drawer above the 2004 Risse Racing Boxxer cartridge). But there are also garage staples which often don't receive their due recognition. For me, the Birzman Maha Apogee floor pump I’ve been using comes to mind. Available for a while now, this pump with a mouthful of a name is designed to quickly inflate high-volume, low-pressure tires. The CNC’d pump barrel is ergonomically slanted toward the user, while the varnished wooden handle could make Louisville Slugger envious. 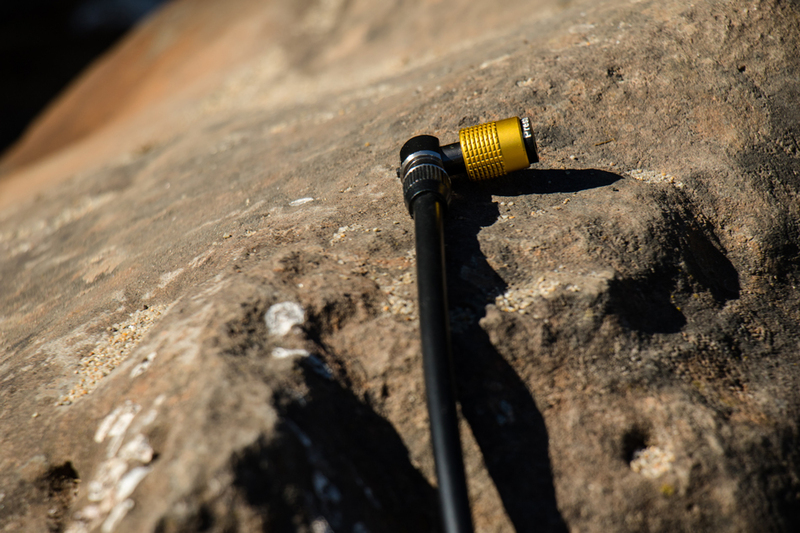 The pump’s most unique feature is the patented Snap-It pump head, which provides a simple and secure way to switch between Presta and Schrader valve stems. The Maha Apogee sells for a reasonable $85. As a tubeless devotee, a pump unable of mustering the force to mount a tire is as useful to me as my stash of 26-inch rubber. 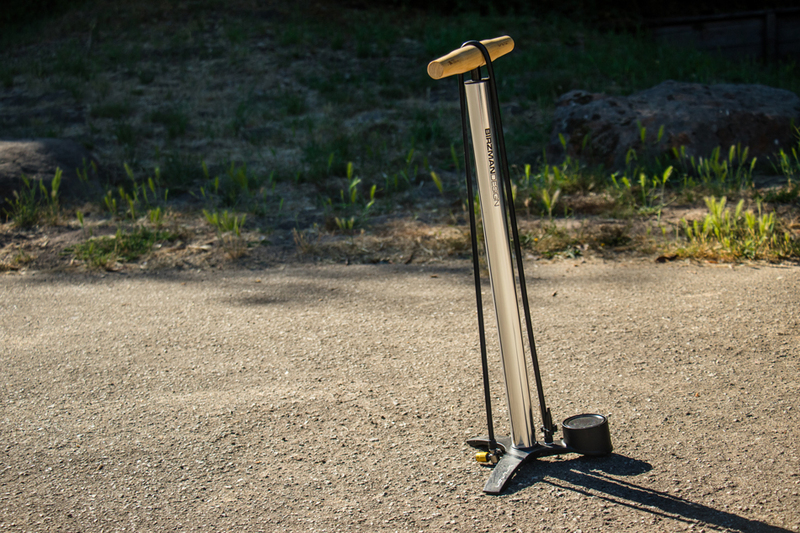 With each pump, the Maha Apogee pushes an impressive volume of air, and I was quickly able to mount tires from Maxxis, Specialized and Schwalbe on a variety of rims. The aforementioned Snap-It head prevents valve blow-offs at high pressures and eliminates damage to a valve core or tube when removing the pump head. Operation of the Snap-It head is simple. For Presta valves, slide the gold piece up to reveal the word "Presta," place the head over the valve, slide the gold piece back down to its original position and thread it onto the valve. A nearly identical process is done for Schrader valves. To remove the Snap-It head, simply slide the gold piece away from the valve and the head immediately pops off. Unfortunately, the gauge that came with the Apogee would stop at 20 PSI each it was removed from a valve. A call to customer service resolved the issue and the replacement gauge has been able to get me in the ballpark of my pressures, although the Maha Apogee's gauge consistently reads 2 PSI higher than my digital gauge. Riders less concerned with achieving precise pressures probably won't be bothered by this, though, and adjusting with a digital gauge after inflation is business as usual for PSI micromanagers like myself. 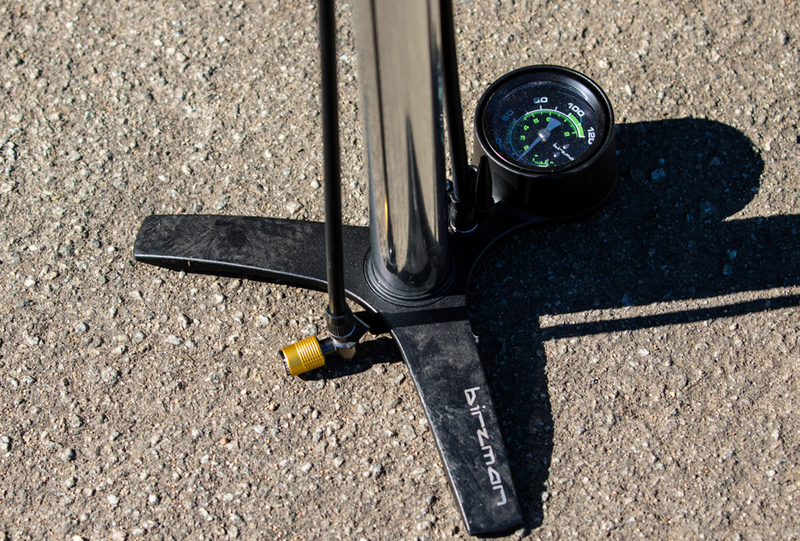 The Maha Apogee's combination of a stable base, powerful tire inflation, durable construction and head-turning style equates to a recognition-worthy pump package.